The P108 is the strongest battery in the Ryobi One+ lineup. At a whopping 4 amp hours, this has a long runtime, serving your needs through a variety of applications. Being the flagship battery for the One+ family, you can be sure that it will work for over 70 18V power tools from Ryobi. It also acts as a fuel gauge. At the push of a button, you’ll be able to see how much charge is left, so you can prepare other batteries as needed. 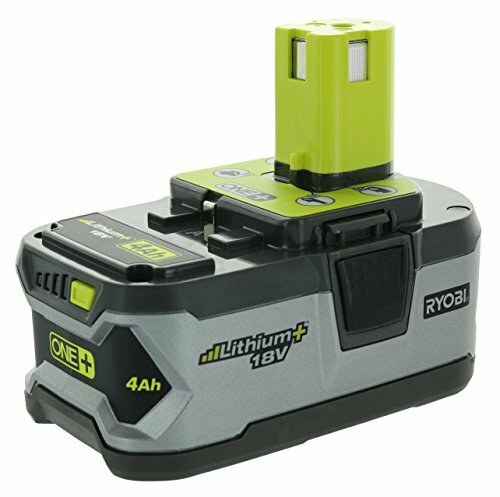 The P108 also boasts one of the fastest charging times out of the Ryobi batteries. It can go from empty to full in as little as 60 minutes! Unlike its NiCad cousins, this lithium ion battery will not drain when not in use, so you don’t have to keep it constantly charging. Simply plug it into your tools when you need it, and rest assured in its reliability. Remember, Ryobi means power done right.